Bill Belichick’s New England Patriots overcame a late 10-point deficit last winter against Doug Marrone’s Jacksonville Jaguars in the 2017 AFC Championship Game. Much has been written about how both coached that game (Eagles head coach Doug Pederson being one such writer). On Sunday, football fans get to see the rematch, and for us here at HCR, the game planning aspect is what most intrigues us. This is why it is our Showcase Coaching Matchup of the Week. 1. Familiarity. There is a recent history between the two teams. Whenever this variable exists, every coaching decision about what to do and how to do it becomes magnified. For example, in trying to protect a late lead in last season’s AFC Championship, the Jaguars made the defensive decision to continue to rely on their talented four down linemen to get pressure on Patriots QB Tom Brady. It didn’t work. Would the Jaguars do the same thing this time around? Also, the Jaguars surprisingly allowed QB Blake Bortles to open it up early in that game, to much success. Will the Jaguars do this again? Doing so would show increased confidence in Bortles, and perhaps playing in front of a friendly home crowd will fortify Bortles’ confidence. 2. How Will The Patriots Score Points? 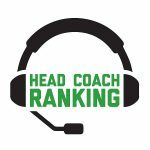 : We see this matchup favoring the Jaguars – almost overwhelmingly so. The Patriots probably will miss both RB Sony Michel and RB Rex Burkhead against the Jaguars, making that position group shorthanded. Even if Michel and Burkhead play, the Jaguars feature fast linebackers who are good in coverage. Additionally, the Patriots WR group is underwhelming – Chris Hogan, Phillip Dorsett and Cordarelle Patterson will be heavy matchup underdogs versus the Jaguars secondary, which features All-Pro CB Jalen Ramsey. The Patriots WR group also is shorthanded; the last 2-3 active roster positions in that group have been turned over a lot since the start of training camp. So how will the Patriots attack? What is the offensive game plan? The Patriots have to slow down the Jaguars rush, but without their full complement of backs to run the screens and other tempo plays designed to offset a pass rush, what will the Patriots do? Perhaps the Patriots come out in heavy formations early, slow the game down and simply accept the challenge of a potential 21-20 game. Either way, it will be fascinating to watch. 3. Jaguars’ Utilization of QB Blake Bortles: Notwithstanding Bortles’ success last season, the biggest challenge for the Jaguars’ offensive coaches is always, “How much do we open it up with Blake?” If RB Leonard Fournette plays, the decision is much easier – it’s “Let’s make sure Leonard gets 20-plus touches and we just play-action off of that.” If Fournette doesn’t play, Bortles will have to make more plays, or at least that is what conventional wisdom would indicate. The Patriots appear also to have an improved defense, and the Jaguars have to be wary of early offensive turnovers that convert to points as they are not necessarily built to play from behind. So will Belichick unleash some early exotic blitz packages versus Bortles on passing downs? Will the Jaguars open in a five-wide formation and confound us? (We doubt that.) Again, it’s judgments like these that make football interesting. 4. Our Conclusion. A very close game that can go either way – a one-point differential perhaps, that may come down to simply having an additional timeout available in the fourth quarter. 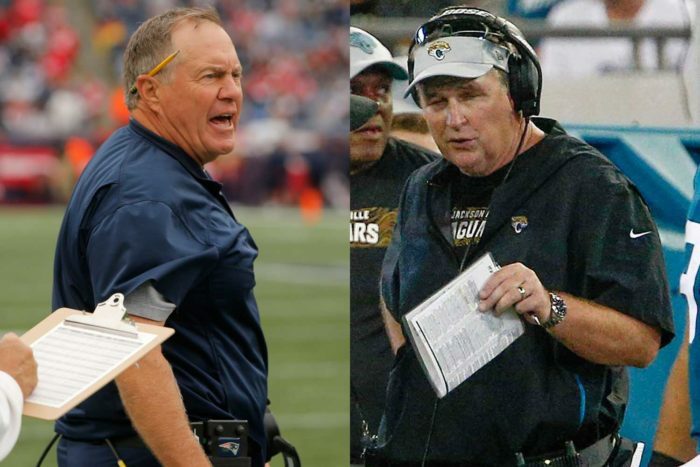 Belichick is a better overall strategist than Marrone based on our HCR data, so perhaps there will be one or two important judgment calls Marrone will have to confront that will decide this game.